Tuscan Pines Villa is one of the best maintained and beautiful vacation properties located in the entire Davenport area. Rick and Jean (owners) are totally dedicated to having all the “comforts of home” to make your stay enjoyable. Our villa has a new Tempur-Pedic mattress in the King Master Suite (2017) and two new Sealy mattresses in the Queen en-suites (2017). New patio cushions were added in May 2017. All master bedrooms have a hair dryer, hair straighteners, change of bed linen, ample towels for home use and beach towels supplied for pool/beach use. Upgraded furniture throughout the villa. Ceiling fans in all bedrooms plus communal areas including the lanai on the patio. All outer and inner doors will accommodate wheelchairs. A “Games Room” in the finished garage is complete with a 7 ft. pool table, new 7ft. air hockey table, a”hoops” basketball game, a foosball table, soft tip dart board and a bar table with two stools. A 26ft by 13ft pool, a 7ft diameter Jacuzzi/Spa, both with “color splash” lighting to provide a light show at night. New poolside PVC patio/pool furniture for up to 10 people. Adult pool floats and tilting sun umbrella. The family room has a 55″ 4k LCD HD television. The two Queen bedrooms each have a 32″ ROKU Smart TV. Digital cable and high speed Internet. Free telephone calls anywhere within the USA and Canada. Removable safety fence guarding pool. Exceptional views of a pine forest from the pool area. 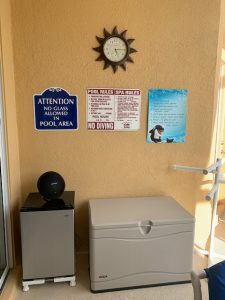 Monitored security alarm system and smoke detectors throughout villa. Complimentary safe for securing valuables. Average time to Disney attractions…10 minutes. 6 full size championship quality golf courses within 10 minutes drive. On-site facilities include a Mediterranean style club house with gym, games room, free internet access, tennis court, full size sand volleyball court, palm garden and small children’s play area. Comprehensive selection of restaurants, fast food, supermarkets, shops and evening entertainment available within 2 to 10 minutes drive. Great location for sightseeing. East and west coastal resorts can be reached within 60 to 120 minutes. In addition new plush carpeting and entry foyer tile was installed in January 2018, so our villa has that “new” look throughout. We have added tasteful Floridian decorations and have ensured that everything is in perfect working order.